We still know too little about Rootham to place him. Certainly if we rely only on commercial recordings we are hard put to it. There is this disc which has come and gone and gone and come over the last two decades. First issued in 1987 just four years after the launch of the CD on CDC 7 49021 2 it made little impact though it was reissued and then deleted again in 1992. It was pre-dated by the Lyrita LP of the robust and athletic First Symphony rejoicing in Blissy garb. Earlier this year it was reissued on CD. The BBC has over the years supplemented the picture with two visionary works – the supple and splendidly singable Ode on the Morning of Christ’s Nativity and the Second Symphony – as completed by Rootham’s Cambridge friend, Patrick Hadley. Then in the 1980s there was a broadcast of the impressionistic Septet by the Northern Sinfonia Wind Ensemble. Add to this a privately made LP of two chamber works from the 1920s, the Suite for flute and piano and the Violin Sonata – the latter impressive in all its sturdy cantabile glory projected by Barry Wilde with Rootham champion Alan Fearon (piano) who also plays a key role in this recording. These are all works worthy of recording projects with the Ode and the Sonata standing tall in all but the most exalted company. The succinct and magical Yeats setting The Stolen Child recalls Moeran’s Nocturne in its quiet and undulating gentle ecstasy. The Miniature Suite is for solo piano and strings. It is a gentle production with a kinship with the Finzi Eclogue, the Parry string suites, RVW’s Dives and Lazarus, Armstrong Gibbs, the lighter Dyson and even some Grainger – try the smiling Molto vivace. Like the Yeats setting, City in the West is quite masterly in its instant capturing of atmosphere and the subtle balancing of orchestra and choir. It clothes Bristol, that much-loved city, in a Delian sunset glow, still warm and dramatically ecstatic; a touch here also of what Vaughan Williams did for Oxford in An Oxford Elegy. I owe a perceptive insight to Percy Young’s 1987 note when relating the lambently-bathed purely orchestral Psalm of Adonis to Kodaly – perhaps his Summer Evening. Avian sounds mingle and enliven this warm evocation which may also passingly recall Delius and Finzi. That lissom rising woodwind-topped figure just near the start is also used in The Stolen Child – something of a Rootham ‘autograph’. Finally comes the three movement work For the Fallen – a setting of Binyon. 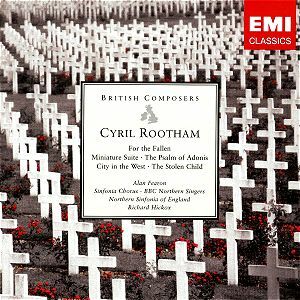 This links thematically with the other three ‘British Composers’ CDs issued by EMI this Remembrance Day month – each touching on war, memory and loss. For the Fallen has the same qualities as the other works here. Add to these a satisfying drum-underpinned tread rising to the majesty achieved by RVW in Dona Nobis Pacem, by Bliss in Morning Heroes and at the end by Howells in Hymnus Paradisi. A year later Elgar set the same poem as part of his triptych of Binyon settings, Spirit of England. This is a comparatively short-playing CD but the music here will be found immediately rewarding despite the words not being provided. That it has returned to the catalogue raises some hopes that the record companies have not forgotten Rootham. He does not deserve oblivion. His Ode on the Morning of Christ’s Nativity (soprano, choir and orchestra, 45 mins) is a major work by anyone’s reckoning. It is as much deserving of revival on disc as Maurice Jacobson’s Hound of Heaven and Nathaniel Dett’s The Ordering of Moses. More Rootham, please.